Editor’s Note: This is Episode 14 of the Fresno Poets Archive Project. It features a poetry reading from Jean Janzen, followed by a performance by Jill Janzen, singing the songs of William Blake with an oboe accompaniment, from December 1991 at the Bonner Auditorium inside the Fresno Art Museum. Background research and closed captioning for this video was conducted by undergraduate student Marisa Mata in Fall 2017. Marisa grew up in Fresno and she knew she wanted to be a writer when she was 7 years old. She’s a senior studying English and Creative Writing at Fresno State. She reads and writes every day to continuously learn and improve her work. Some of Marisa’s favorite authors include Toni Morrison, Anne Lamott, and John Hales. She tutors first-year writers in the Fresno State Writing Center, and she plans to write books and become a literature and writing professor. In this blog post, Marisa reflects on coming to a poetry reading expecting only poetry, and what happens when you are given something more. At the age of seven I felt a creative impulse that led me to singing and then to writing. 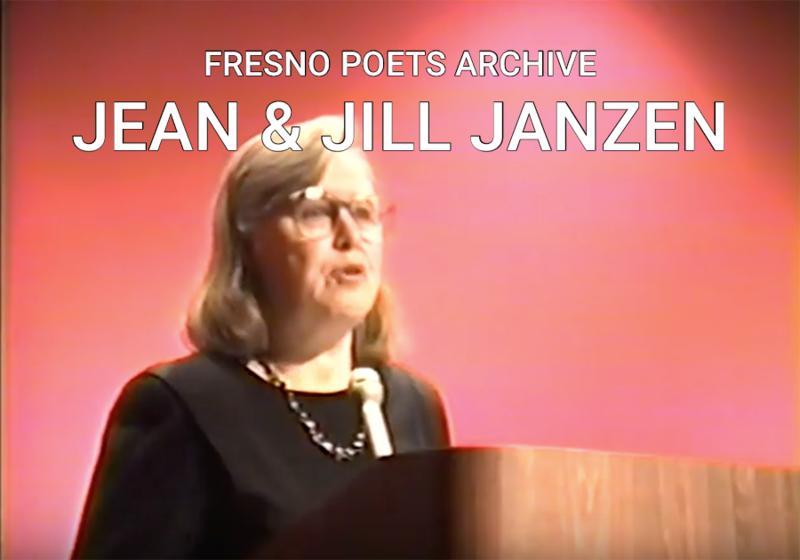 It wasn’t until watching this video of the poet Jean Janzen and her daughter, the vocalist Jill Janzen — recorded at the Fresno Art Museum in 1991 — that I started to think about the connection between the two. I’ve wondered what compels people like Jill Janzen to bring together the written word, the rhythm of music, and vocals of singing. What made her decide to perform William Blake’s poetry as songs? While I first watched Jill perform, with oboe accompaniment by Rachel Aldridge, I wondered if the singing and music brought a new meaning to Blake’s songs of innocence and experience. I tried to think of poems that I would want to sing, songs I would like to hear recited as spoken-word poems. And it was difficult for me to think about. Singing and writing, for me, didn’t feel like they went hand in hand. One morning I was reading a collection of poems by Samuel Taylor Coleridge, and some of the poems reminded me of a composition by Mozart, “Requiem.” They shared feelings of sadness, anger, fear, frustration, and I couldn’t help but pair the two. Then, I started to think of how I listen to music almost every time I sit to write, how it sometimes influences my words and sentences. I thought of a dance performance I saw that has inspired some of my writing recently. I thought of how I sometimes look at photographs for inspiration. And I thought about how in this recording, Jean Janzen even brings famous paintings and painters into her poems. Our impulses and the works we create from them all seem to be connected. They need each other to come into existence. So I don’t think it’s too important to ask why Jill Janzen chose Blake’s poems, or to sing her songs in a particular style or to be accompanied by an oboe. What’s important is that she went to this reading and did something out of the ordinary, and may have fed others’ creativity. The performance fed mine.